We've already seen her on court in a striking black catsuit. 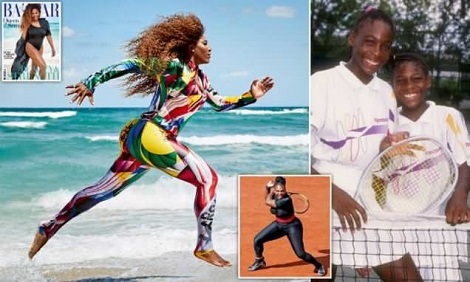 Pictured running in another skin-tight all-in-one – this time in a rainbow of colours – Serena Williams clearly isn't shy of outfits that scream: Look at me. But the 23-time Grand Slam champion hasn't always been a picture of confidence. The tennis star has revealed how she struggled growing up alongside her 'thin, tall and beautiful' sister Venus. It has taken the 36-year-old time to accept her body – but she now sees it as her 'weapon'. The sportswoman, who gave birth last year to her first child, Alexis Olympia, added: 'But I love that I said that, because I can understand. I can show Olympia that I struggled, but now I'm happy with who I am and what I am and what I look like. 'Olympia was born and she had my arms, and instead of being sad and fearful about what people would say about her, I was just so happy'.